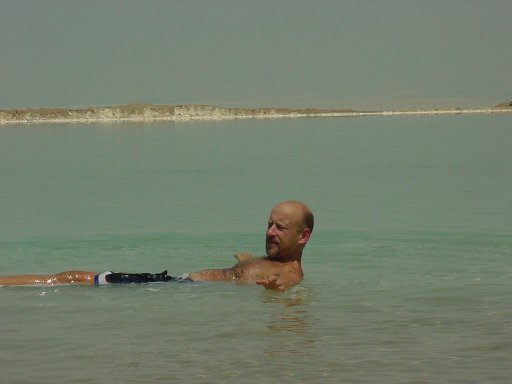 Swimming in the Dead Sea was an experience I will never forget. My brother and I arrived at the shore with the tour bus, and we were given a small baggie full of Dead Sea mud. We were instructed to smear the mud all over our bodies, with special attention to places where we might have had illness or injury. Once ensconced in the mud, we went into the salty water and cleaned ourselves. The water was warm and burned any cuts or scrapes that we may have had. But the combination of the mud and salt is said to have healing properties. The Dead ea is the saltiest body of water in the world, and it supports no marine life because of the high level of salinity. Due to the high salt content, a person can float on the surface of the water with no chance of sinking or going under the surface level. The weight of the body displaces the salt, but if you lie flat on the surface, you'll stay that way. the hard part is that the buoyancy also makes someone trying to stand up tip forward, and you could end up face first in the water. Water that salty does not taste very nice.